The whole body is fiberglass. The front fenders extend all the way to the back, but they also point slightly down at front instead of aiming at the sky. The undersides of the fenders - most of the side of the car - appears to be flat black. The tail is much longer than previous cars. It's not apparent from this picture, but the hood and nose are all one piece and tilt forward for engine access. The dashboard is also fiberglass and not flat. And the hood latches inside at the middle, apparently with an inside release. note the exhaust travels along the side, then back through the body and out the back, instead of being a sidepipe. That may have been a legislative thing; many US states have had laws requiring the exhaust to exit some specific distance behind the last openable window, etc. The press release says, "increased leg room ... Europa concept double wish-bone suspension ... collapsible steering column ... extensive sound proofing ... hazard warning light ... glass fibre body shell, double skinned at cockpit sides and fully weatherproofed ... 165 x 13 Sport radial ply tyres ... 13 in. steering wheel ... ammeter ... two speed wiper ... screen washer ... heater ... rubber mats ... diagonal seat belts ... weight from 1102 pounds ... 7-1/2 gallon fuel tank behind seats protected by chassis structure"
The earlier cars used 15" tires as far as I know. The brochure for the 4 says "13" in several places. From the description at simplesevens.org and the drawing above, it looks like the rear axle location was entirely different than the S3 or later Caterhams, using a four link instead of an A-frame. My eyes always slid over the Series 4 cars. The styling is a product of its time, I guess, but it always looked like someone built the buck out of plywood and rounded the corners a bit before making a mold. For a dune buggy body to go on a used VW pan, sure. But at Lotus prices, I can see why they gathered dust in showrooms. The entire front suspension was much more closely related to that on the Elan/Plus 2/Europa, with a front crossmember and suspension turrets not dissimilar to those used on the Elan's backbone chassis, and shared many components. Anti-roll bar was mounted low down and attached to the bottom wishbone, and yes, its the usual Triumph uprights with trunnions. The pedals were top mounted. They were carried the 'bulkhead panel' that you can see on your chassis diagram, on which you can see the holes for mounting the master cylinder. ...From the description at simplesevens.org and the drawing above, it looks like the rear axle location was entirely different than the S3 or later Caterhams, using a four link instead of an A-frame. Yes, entirely different. 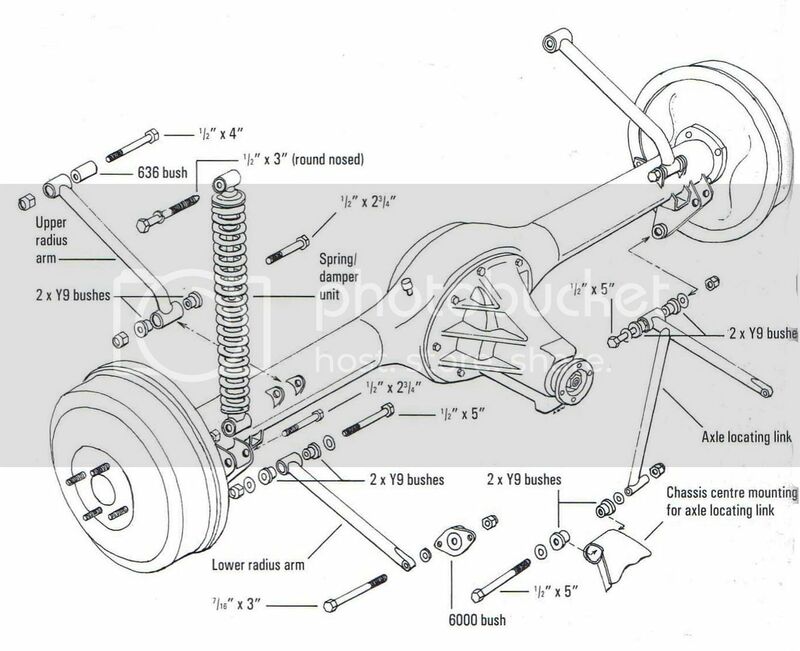 The S4's rear suspension was even more conflicted than that on the 'normal' Seven, and relied on a big, squishy bush (the one marked '6000 bush' on the diagram below) to give some roll compliance against the fore-and-aft Watts linkages. The compliance from this bush led to some problems with axle tramp. A company called Sylva over here in the UK uses a similar arrangement (albeit with a Panhard rod instead of triangulated lower link for transverse location), much more successfully, by just relying on the small amount of compliance in the 'normal' bushes at the ends of each link. And yes, the car was very much a product of its time and the dune buggy styling was quite intentional - VW-based dune buggies were extremely popular here in the UK, back then! It was killed off not by unpopularity, so much as the twin issues of Colin Chapman's desire to move the company's products up-market with the wedge-series Elite and Esprit, coupled with the closing of a loophole on purchase tax, which had previously exempted component cars in the UK, the loss of which made it commercially much less attractive. Do you know anything about the sheet metal panels? From the picture, I can't tell if they were riveted aluminum, or welded steel. I'm interested in the welded steel option, for my next build (a Morgan 3 Wheeler replica). If I want to incorporate the body curvature into the frame, then the skin will have to be stressed, or the diagonals a smaller diameter. For aesthetics, welding would be a cleaner look. An example would be the JZR tub. Do you know anything about the sheet metal panels? From the picture, I can't tell if they were riveted aluminum, or welded steel. Well, they're welded steel on the Seven S4, I know that much! The JZR is a nice little car, but remember that, being a three-wheeler, its requirements for torsional stiffness are much lower than those of a 4-wheeler. My guess is that to gain sufficient stiffness just using single curvature, single-skin stressed steel panels, the steel would need to be relatively heavy gauge? TRX, there is something wrong with your link. I think it is a much better car, and not just because of the weather protection. The seats are molded into the tub also and it is much easier to install the engine and trans with the removable front upper crossmember. The frame is less rigid than the s3 but the glass body contributes to the rigidty. The sheetmetal was spot welded to the tubing. The 4 link is actually two watts linkages mounted sideways. Some were made by Caterham and by a company in NZ, but I forget who. Yeah, I tried pasting it three or four times and it never would "take." You can copy it and paste it into your URL bar and get there, though. It's a fairly interesting design analysis of the S4. If you delete everything after "pdf" it works. Great article! The press release says, " ... extensive sound proofing ... "
Well then take my money! I've always rather liked the styling of the S4--even simpler than the S3 and earlier models, and simplicity is the primary charm of the Se7en--and if I'd been one of the three lottery winners day before yesterday, I'd be looking for an S4 so I could own a Real Lotus. Sam_68, thank you for pointing out the error of the S4-was-a-failure-and-nobody-liked-it legend. PS--though I've never ridden in an S4, or even seen one in person, "extensive sound proofing" sounds a bit of wishful thinking. Just getting the exhaust out the back of the car would have enough sound proofing for me. Looking at some pictures, the front of the frame on an S4 sure *looks* to be less tapered than an S1, and the front of the chassis looks wider. I can't find any drawings of the S4, or even any pictures I can make a direct comparison with, though. From what I've read the sheet metal panels on the S4 chassis were welded steel. I've wondered whether corrosion was an issue, from water getting into the gaps between the panels and the frame tubes, but I haven't found any mention of it. The cockpit opening still looks longer than on the earlier cars. Even though I think the dune buggy bodywork is fugly, the S4s are fascinating for some reason. I did find pictures of two S4s where the owners had junked the fiberglass bits and rebuilt them to look like S2s. I've wondered whether corrosion was an issue, from water getting into the gaps between the panels and the frame tubes, but I haven't found any mention of it. Yes, it very much was. There's a book (now very rare and valuable) called 'Lotus Seven: Restoration, Preparation, Maintenance' by Tony Weale that covers the S4 in some detail, including the chassis design and restoration, but suffice it to say that it's a real rotbox in exactly the areas you've identified. But they made it up in quantity. I still like the S4. I think it has potential as a semi-replica DIY car...but then again, as my dad used to say, You can do anything you want, you just can't do everything you want.